On May 11th of the year 1820, Bartholomew Barrow purchased 1,025 arpents of land (approximately 867 acres) from his brother, William Bartholomew III of Highland, for the sum of $20,000. This acquisition would lead to the creation of the beautiful gardens of Afton Villa. Bartholomew Barrow lived on this plantation for almost twenty years. 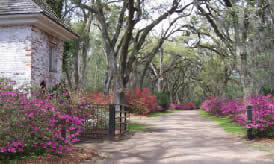 At the time, the residence was a white house with columns and galleries, probably very similar to Live Oak. In 1839, Bartholomew sold the Afton property to his son, David (1805 – 1874). The census of 1860 records that he was the wealthiest man in West Feliciana Parish. David Barrow was born in Enfield, North Carolina in 1805. Very little is known of his early life. The tradition is that he was on route to attend Princeton University in New Jersey when he stopped for the night at Moseley Hall in Lenoir County, North Carolina, the home of Matthew and Elizabeth Herring Moseley, who were at the time entertaining their beautiful young granddaughter, Sarah (Sallie) Hatch. Young David was captivated by Sarah and gave up the idea of college and married Sarah instead in 1823. Sallie was only fifteen at the time of the wedding, while David was just three years older. In 1830, David and Sallie Barrow made the overland trek from North Carolina to Louisiana. Upon reaching West Feliciana Parish, Louisiana (the trip took one month) they purchased or rented a plantation on the Pinckneyville Road opposite Live Oak, the estate which was then owned by William Hill Barrow and his recent bride Eliza. It is believed that David established his new home at Solitaire, which had been the residence of his half-sister, Ann Barrow Ratliff, prior to her death in 1828. David and Sally lived there only two years, during which time their daughter Francis died and Sallie had twins that died shortly after their birth. After the loss of three children, David and Sallie decided to return to North Carolina. In about 1832 they moved back to the North Carolina home. During this time three more children were born: Louisa, Francina, and Bartholomew II, called Batt. David and Sallie Barrow remained in Florida just two years and then they returned to West Feliciana Parish, where they lived the remainder of their lives. On January 9, 1839 he purchased the Home Place (later called Afton Villa) from his father, Bartholomew, along with eighty-three slaves and lands in Pointe Coupee Parish for $110,000. The Afton Property had been purchased by David’s father in 1820 and had a comfortable, unpretentious dwelling which became their home. However, his largest planting interests were always centered in Pointe Coupee on the west bank of the Mississippi River, rather than in the parish where he resided. After returning to Louisiana, Sallie gave birth to a little girl, Louisa Ann, who died at the age of two and is buried in the family cemetery at Afton. She had much sickness during her married life, but was said to have been a most beautiful girl. Unfortunately, no picture of her survives. She died in childbirth in 1846 and was buried at Afton. At the time of Sallie’s death, David Barrow was only 40 years old. His daughter Mary was married and his son Batt was eleven years old. As the story has been retold, David and his daughter Mary were sitting in the lobby of the St. Charles Hotel in New Orleans when he noticed Susan Woolfolk pass by. He was immediately attracted to her and is said to have commented to his daughter that he intended to make her his wife. Susan was the widow of the late John A Rowan of Virginia, who was visiting New Orleans with her sister, Sallie Wookfolk Meade. A meeting was arranged and in the summer of 1847, David Barrow, accompanied by his son, Batt, traveled to Kentucky to marry the beautiful young widow of twenty-six. When David Barrow married his second wife Susan, she found their modest two-story residence near St. Francisville in West Feliciana Parish, Louisiana not at all to her liking. To please Susan, a striking brunet fond of dressing stylishly and accustomed to living on a grand scale, Barrow told her she could build any house she wished, as long as the original dwelling remained intact. Susan agreed by building over and around the original, smaller residence. 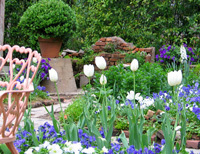 Thus, began the creation of Afton Villa and its splendid gardens. Afton Villa was once the most imposing estate in West Feliciana Parish – the 1849 plantation residence of a demanding mistress, Susan Barrow. She lavished 8 years on creating the 40-room Gothic Revival mansion, as well as elaborate gardens that stretched over 25 acres. Impressed by the fashionable Gothic mansions she had seen in France and along the Hudson River, Mrs. Barrow decided upon a Gothic revival home. Construction of the splendid towered and turreted French residence began in 1849 and took eight years to complete. 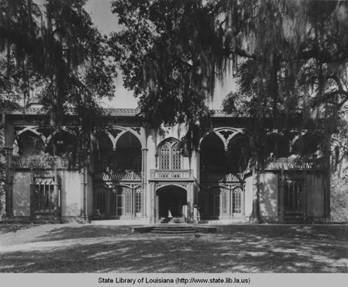 The L-shaped house with forty rooms, including fifteen bedrooms, was one of the largest and most unusual plantation homes in Louisiana. The stucco exterior of the fairy-tale castle was painstakingly incised and sanded to resemble stone and was embellished with carved cypress. The Barrows lived at Afton through the Civil War. Following David Barrow's Death in 1874, Mrs. Barrow left the plantation, never returning, and is buried in her native Kentucky. In 1915, Dr. Robert E. Lewis of Illinois bought Afton Villa, and with his wife, made the outstanding contribution of resurrecting the old gardens. In 1945, Afton Villa became the home of Mr. and Mrs. Wallace Percy who completely restored the house to its original grandeur to make it a showplace.